GrayZone Project — The right-wing opposition leader that the United States is trying to undemocratically install as Venezuela’s president immediately set his sights on the country’s state-owned oil company, which he is hoping to restructure and move toward privatization. He is also seeking money from the notorious International Monetary Fund (IMF) to fund his unelected government. On January 23, US President Donald Trump recognized the little-known, US-educated opposition politician Juan Guaidó as the supposed “interim president” of Venezuela. 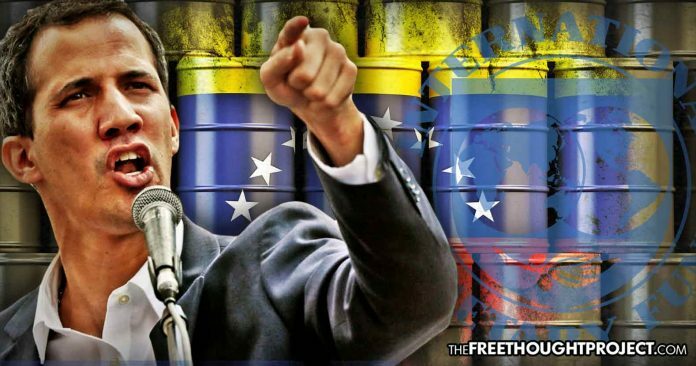 Within 48 hours, Guaidó quickly tried to seize control of Venezuela’s major US-based oil refiner and use its revenue to help bankroll his US-backed coup regime. … the US imposed sanctions that have severely hampered PDVSA’s ability to raise new financing or restructure its crushing debt load. US officials said they are prepared to invoke further sanctions on Venezuela’s oil sector, including a full embargo on US imports of Venezuelan crude, if Maduro’s standoff with Guaido escalates in further violence or political crackdown. Neoconservative US Senator Marco Rubio, who has been deeply involved in the coup, also let the cat out of the bag when he repeatedly brought up oil, and publicly called on oil workers to “cut off” Maduro and “begin working” with Guaidó. The attempted restructuring of Citgo would just be the beginning of the neoliberal capitalist policies implemented by Venezuela’s US-backed coup regime. The International Monetary Fund is notorious as a vehicle for US political and economic influence. For decades, the IMF, along with the World Bank, has trapped ostensibly independent Latin American nations in debt and imposed so-called “structural adjustment” programs that force governments to impose brutal neoliberal shock therapy on their populations, including austerity measures, privatization of state assets, deregulation, and gutting of social services. Guaidó has moved to re-integrate Venezuela into these very same Washington-dominated financial institutions. In addition to seeking financing from the IMF, Guaidó is likewise trying to send a new representative to the Inter-American Development Bank.